For your deep spring clean, instead of focusing on organizing those kitchen cabinets, consider giving your bathroom a makeover instead. Whether it is small or expansive, these bathroom design ideas can help you revamp your bathroom look so it becomes a standout in your home. The biggest trend for 2018 is getting creative with your bathroom worktops/countertop. Choose from a multitude of options, but make sure the worktops you choose truly represent your style. You want your bathroom to be a calm, relaxing place to take a bath or a shower, but don’t be afraid to use bold colors in one or two areas. How about pairing neutral worktops with bright blue cabinets? 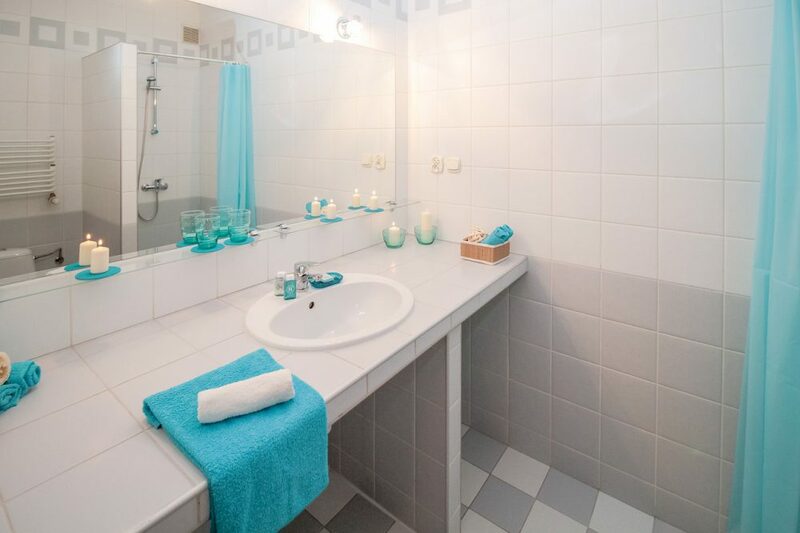 Or use some brightly-colored tiles among the white. Either way, tossing in some color will surely make the chosen accent the focal point of the bathroom. Nobody wants to see too much clutter in the bathroom, but for some reason, that’s the room where we are the guiltiest of creating it. Invest in wall-unit type cabinets so you can keep the clutter out of the way and create a sense of calm in your bathroom. Sleek, shiny worktops, as long as they are tidy, will instil a feeling of order in your bathroom. And quartz worktops, in particular, are resistant to mold and mildew and will look good for many years. Another one of the interesting bathroom design ideas this year is the industrial bathroom look. Here are some ideas for how to achieve it: shiny gold or silver faucets and knobs; a grey-blue matte paint color; or a metallic colour for your bathroom worktops. Choosing a strong metallic color for your worktops will not only make your bathroom beautiful, it will also keep it stain free, as a dark color will hide imperfections. Who doesn’t love the look of a hotel bathroom? Make your bathroom feel like it’s part of the luxury suite you stayed in for your honeymoon. Invest in a sunken bathtub or raise it up a bit in the middle of the room. Or add some fancy accents to your shower, like a built-in shelf or some expensive tiling. Pamper yourself in style. How ever you choose to update your bathroom, make sure you improve the look by upgrading your bathroom worktops, first and foremost. Installing quartz worktops will increase the value of your home while making it an enjoyable place to live.